We often get contacted by many of our customers, with details of projects that they've used our equipment or products on and have now decided to start posting some of the received case studies. The following was sent to us by Stone Edge and shows; 'Hellifield War Memorial restored using state-of-the-art cleaning technology'. A treasured local war memorial has been restored to its former glory thanks to the latest innovation in cleaning equipment. Building conservation experts at Stone Edge have restored Hellifield War Memorial, in North Yorkshire, which commemorates local residents who were killed or missing in World War I and World War II. The monument was restored with the aid of the very latest superheated water cleaner from Bristol-based Restorative Techniques. The brand new system, ThermaTech® was used for stone cleaning by removing pollutants and dirt build using nebulous water sprays. Highly effective in removing soot and grease, oil and organic matter from a wide range of materials, ThermaTech®'s high temperature can melt and remove anything from paint and surface treatment to chewing gum and wax. Unlike conventional pressure washers, the system combines high temperature and pressure with low water volume, providing a 'superheated' liquid spray at 150°C. It also uses less water than conventional pressure washers. ThermaTech® was designed and built by Restorative Techniques, an innovative manufacturer and supplier of surface cleaning systems and in the formulation of restoration products. In addition to stone cleaning of the memorial, Stone Edge re-painted the names of the war heroes and carried out repairs and general conservation work. The conservation project was completed in preparation for the 100-year anniversary of World War I in 2014. 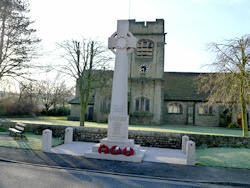 The memorial was originally erected after the First World War. Names of those who died in the Second World War were later added. Hellifield is the first memorial conservation project carried out by Stone Edge in 2012. Stone Edge is one of the UK's leading historic building restoration companies. The firm restores buildings to their former glory, while protecting their heritage value. As a leader in stone masonry, Stone Edge specialises in all aspects of high-quality stone maintenance, stone cleaning, reconstruction and repair of historic buildings. For more information, visit http://www.stone-edge.co.uk. Please contact us, if you would also like us to include your own examples on our website.